Hello! Interesting week spent with the girls and lazing around at home. Done my nails which was inspired by SecretLifeOfaBioNerd. Do check out her channel if you like DIYs, makeup and fashion. One of my fave Youtubers, heh. Anyway it actually meant Smile in Braille alphabet which made it seem kinda cool. 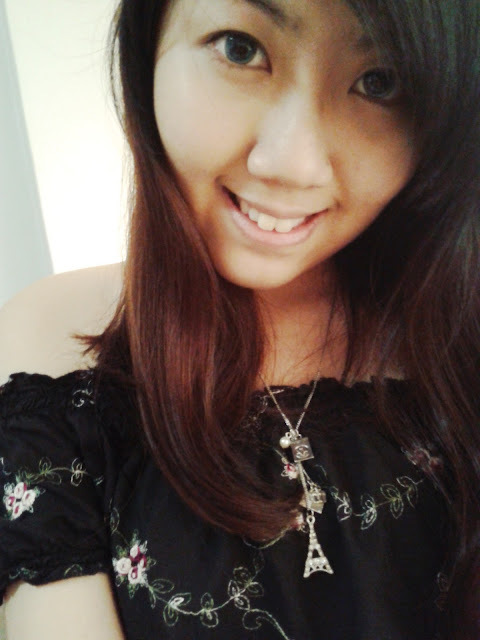 Changed contact lens to blue~ but friends said they looked green, lol. If only my eyeballs weren't this small, I'll gladly wear clear lens, sigh. Then thanks to them, I was able to try Din Tai Fung's food, first trip there with them and yup most of their dishes are yummy. Here are the crispy duck meat and stir-fried dou miao. 2 of my fave dishes below! Like salad but Chinese version. Pretty scared and heart pain the dental costs. Sigh why tooth why? Hopefully it will turned out well and there goes my time to want to find a job. Everything had to come together...I seriously have a weak heart.